I have two games online at the moment, and a few others (commercial and personal projects) that I should get around to posting at some point. I created “Orbitorus” for Global Game Jam 2012. [Play it now]. The theme for this game jam was this image (of the Ouroboros). I was working alone (again :/) since I wasn’t able to attend for any real length of time (but I could work at home on my laptop). My initial game idea was a sort of “serpent rocket” game in which the player had to launch a rocket in such a way that it would eventually hit it’s own tail (launch point). While interesting, the feat of aligning the rocket’s path turned out to be horrendously difficult for a player (me) to achieve. The game design then proceeded in more of an abstract direction. The serpent “tail” was visually distracting, so I just left it out (changing the serpent to an “Orbitorus”). I still wanted to communicate the feeling of return, but didn’t want to burden the player the onerous task of a perfectly aligned return as the primary goal. So I changed the goal to activation of nodes (attractors) and made the return automatic after the goal was complete. These changes made the game feel much better, but it had little replay value. Inspired by cyclical level sets (prevalent in early 80s games such as Gorf), I figured that I could further reinforce the feeling of “infinity” by creating a set of levels which would be classically easy (ish) to complete, but difficult to master. A simple way to achieve this was to record the player’s score when they first complete the level, and to later require them to beat that score the next time they encountered that level. The beat-your-last-score mechanic worked surprisingly well. It introduced a fair amount of replay value because it created another consideration and challenge. Players need to progress incrementally (beating the existing high score by as little as possible) in order to progress further and further into the game. Over time, I found that I could not only pass every level, but also pass them in different ways with a relatively controlled final score. The theme of incremental progress resonates strongly with me. It seems that people often want to wildly proceed in large bounds, but often burn themselves out and fail to achieve their larger goals. So I’m happy to have created a game that encourages and rewards measured actions, practice, experience, and thoughtfulness. Overall, I’m very happy with this game. 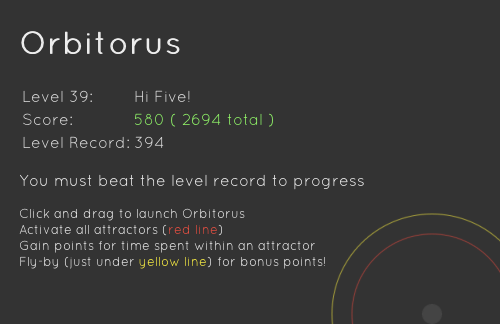 Unlike my previous Global Game Jam games, I focused more on gameplay (rather than story or message) and I feel that Orbitorus is much more enjoyable as a result (which isn’t always the end goal, but was important to me on this occasion). Moreover, the game conveys a stronger message as a result of greater gameplay depth. I created “It’s Lonely Being Alive” as a solo project for Global Game Jam 2011. [Play it now]. This game was designed to communicate the theme of “extinction” and I feel that it’s accomplished in this regard. The story revolves around life support spacecraft that arrive in a small solar system. In order to stay alive, the ships need to produce fuel by consuming resources on the planets they visit. If the ships consume too many resources, the planets die (and will not produce any new resources). The player controls one such ship. While the player can last for a while by traveling between planets (giving them time to regrow their resources), the game inevitably ends in the player’s demise. In order to live forever, the player would need to constantly monitor and balance their consumption, but there is always the risk of the other ships upsetting that balance. At time of release, this game required Chrome or Safari (maybe Firefox 4) to play, but it should work in a wider range of browsers now. Is the concept Nintendo DS Lite Compact coming? I want it real, not a concept!